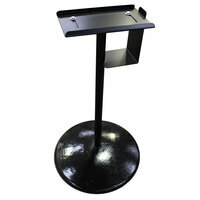 Black Produce Bag Roll Holder/ Paper Towel Holder - 13 1/4" x 6 1/4"
Use this black produce bag roll holder to make shopping a breeze for your customers. A necessary accessory for any market, this produce bag holder is perfect for your produce section. 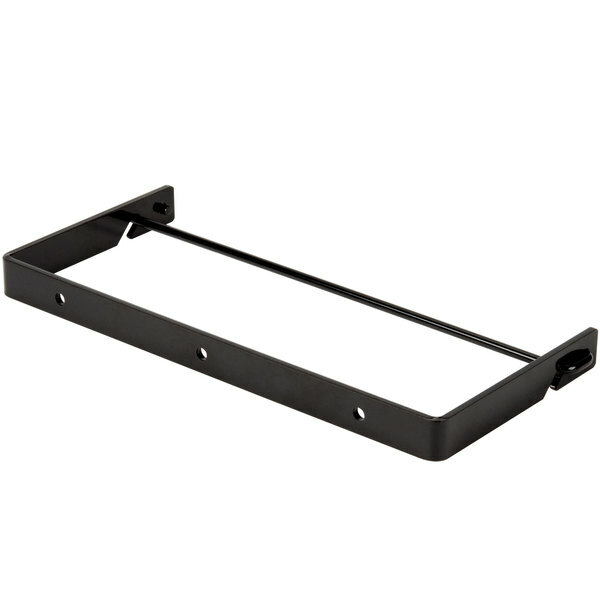 This holder is compatible with plastic food bags on a roll as well as general produce bags. You can even use it with paper towel rolls! Give your customers easy access to produce bags while shopping for a faster and more efficient shopping experience. Mounting hardware and three screws sold separately. "These produce bag holders are heavy duty they work great at a great price plus the shipping was real fast getting here going to order more." 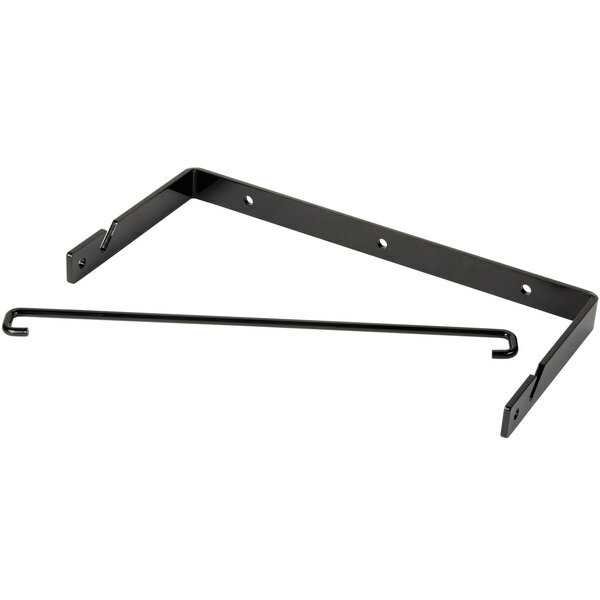 Secure this bag holder on a wall, counter, or display stand for easy access. Mount it near your produce so your customers can easily see and access plastic bags for their product. 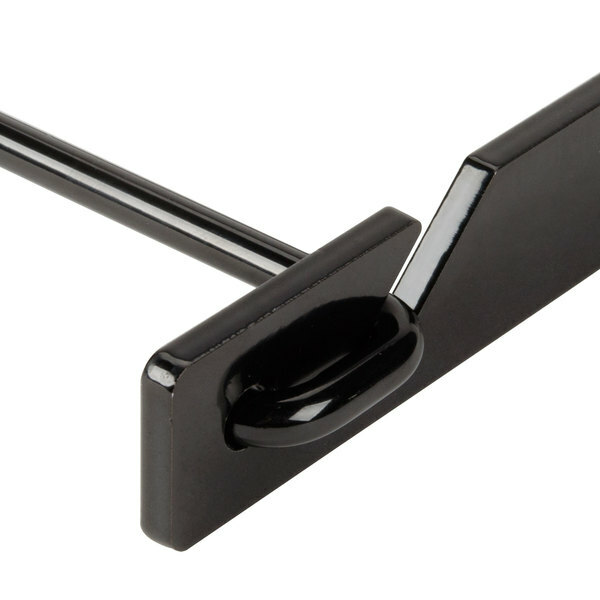 The 1/4" spindle fits into the holder securely so you don't have to worry about the rolls falling off during use. It allows any roll of bags to spin freely to give customers access to one or several bags at a time. 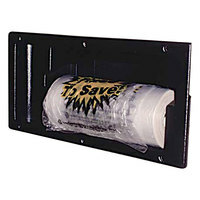 Whether you need to supply produce bags or paper towels this holder will get the job done! 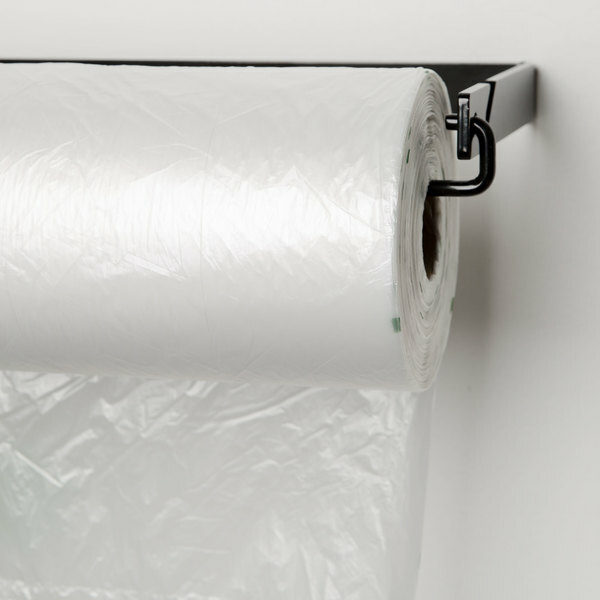 The thin spindle ensures that any roll can fit with ease, so now your customers can easily grab one section of paper towels or one bag at a time without a problem. Item #: 182PBAGHOLDR Black Produce Bag Roll Holder/ Paper Towel Holder - 13 1/4" x 6 1/4"
Item #: 568BHC5 Floor Mount Produce Bag Stand 48"
Choice Deli Saddle Bag Stand - 8" x 11 3/4"
Overall User Rating: Black Produce Bag Roll Holder/ Paper Towel Holder - 13 1/4" x 6 1/4"
These produce bag holders are heavy duty they work great at a great price plus the shipping was real fast getting here going to order more. 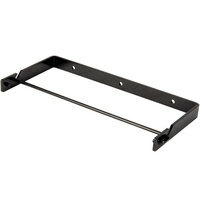 Assembling the Black Produce Bag Roll Holder - 13 1/4" x 6 1/4" is easy. Put bar in 1st hole. Then press that side toward your body and pull the other side into the hole. Glad that I purchased. These bags are the perfect size for either larger orders of chocolate covered pretzels, or to put orders of multiple smaller things in. I thought they'd work when I saw them, and they meet my needs perfectly. Great product that was exactly as advertised. We bought a roll of bag and we thought this would be a great way to hold them - the product met our expectations. I would highly recommend this product. 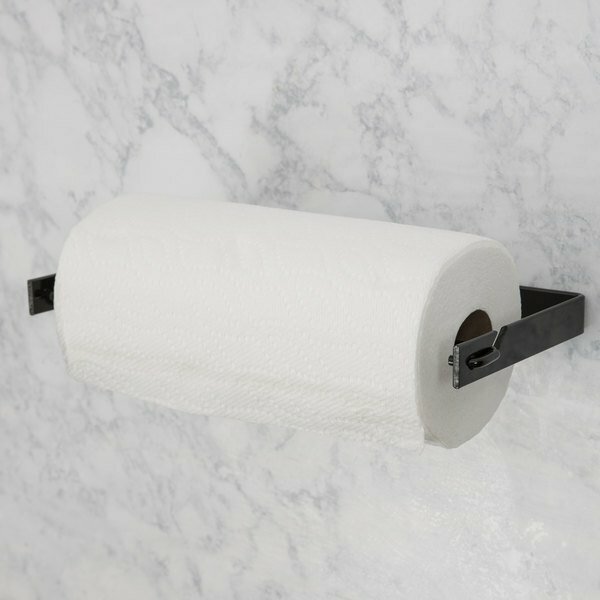 This paper towel holder is simple and does its job. It was also easy to install. The only downside is that it requires some force to change the paper roll so it's important to put it somewhere that wouldn't be a weird angle for the hands/arms/shoulders. We use these holders for our produce bags, super inexpensive and we ended up placing them all over the restaurant, helped us replace expensive ziploks. This paper towel holder is very difficult to use. The bar that hold the roll secures very firmly. A couple staff members have had to ask for assistance to replace. Thank you for the review Dan Perry. We’re sorry this has not worked well for you. 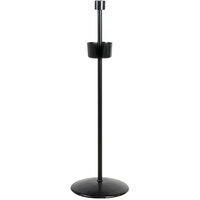 For an alternative that might better meet your needs, try this Choice Wrought Iron Paper Towel Holder - 6" x 12" instead! Appears to be a quality product. The real test will be when we beat it up for a few months. Its relatively inexpensive, so we are not concerned about longevity. We bought two of these for our rolled bags. They do work out for our needs. The only suggestion for the product is that the description would include that hardware is not included with the item and better instructions on the proper use of the item. This holder was easy to set up, but not so easy to install the bags. It was a little difficult to figure out, but once we did, it was OK.
Great price for a great item! Very sturdy, thick metal bracket to hold the produce meat bags. Easy to change bags and it doesn't fall apart. This bag holder works great for storing food storage bags! Those bags are great for pre scaling dry ingredients for baking bread and even as small trash bags during prep!!! This is a very good bag holder if you have a retail business. It will show a most practical and effective image of your business, and your customers will thank you. This is a great bag holder. It holds almost every type of bag on the market. The roller can be a little resistant, but a few drops of WD-40 fixed that.